There’s an old saying which goes “The best things in life are free”. Even better are those things which will forever remain free. 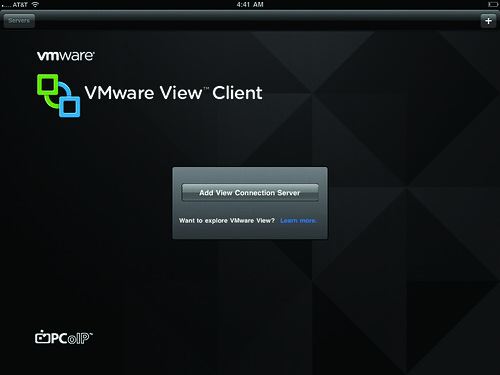 Such is the case with the new VMware View Client for iPad, announced and made available this morning! By the time you read this, the bits will already be available for download in the Apple App Store. GET IT NOW! Development efforts for the new client stem from VMware Product Manager Tedd Fox who is no stranger to iPad Apps. Tedd also lead the development and is on the patent for the Citrix client for the iPad. Tedd’s policy? “I never charge for clients”. So long as Tedd is at VMware, this client (and future versions, of which there are going to be many, rapid fired) will be free. vVC is purpose built for the VMware View use case and associated connectivity. I think this will be important to keep in mind as the product is run through its paces and feature requests start to roll in. VMware is going to pay more attention to feature requests which tie to its use with View and align with the VMware Enterprise Desktop architectural and strategic direction. Instead of a hockey puck like cursor, the vVC sports a rendered track pad on the iPad surface. VMware believes this no nonsense approach leads to a better user experience. The track pad, as well as other dockable modules such as function keys, can be moved around the display or hidden. Other than the price tag, protocol is the biggie: vVC supports PCoIP only. 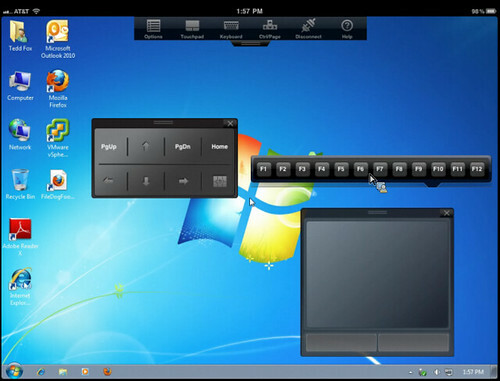 Whereas PocketCloud supports Terminal Services/Remote Desktop RDP, View (RDP) and VNC. We’ll see if this drives VMware View 4.6 upgrades/deployments which boast the required PCoIP gateway feature. Alternatively, I’m assuming vVC PCoIP via VPN tunnel will also work with VMware View versions 4.6 and prior. The vVC is currently available for iPad only with Android tablets targeted mid year. There are no plans to support the smaller 7″ range of devices. Tedd explains “the app just doesn’t feel right on smaller devices.” No comment as of yet on HP TouchPad futures. iPad 2 compatibility? The honest answer is nobody knows at this time. Nobody but Apple has an iPad 2 today. 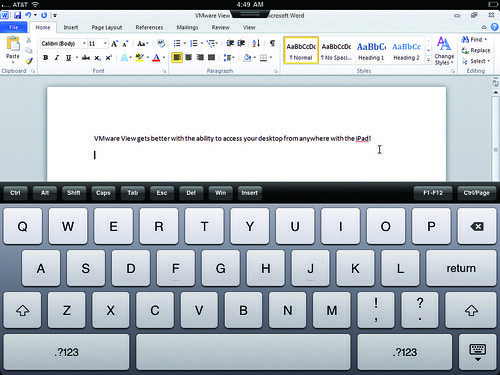 vVC will likely work on the iPad 2, but there is a chance it won’t. With future versions of vVC scheduled to come fast and furious, I doubt the wait would be long for full functionality on iPad 2, if it doesn’t already work out of the gate on March 11th when iPad 2 is released. What we do know is that PCoIP does not currently support cameras, iPad 2 or otherwise. vVC will support unidirectional audio. However, due to lack of Teradici integration, there will be no bidirectional audio support for this release. 1024 x 768 video out is supported with the Apple VGA adapter (sold separately). vVC supports connectivity to multiple brokers and multiple sessions, but not simultaneously. Not until there’s a compelling use case. There is no iPad multitasking support in the GA version but it is being worked on. Wyse PocketCloud doesn’t have this either, or at least it doesn’t work for me as sessions are always disconnected when I multitask. Dock keyboard and Bluetooth keyboard pairing support. Local/LAN printing from the VDI session is supported, Apple/Air printing is not. This is the place for feedback/discussion. Tedd is passionate about the end user experience and iPad App development. As such, he welcomes feedback via email: tedd at vmware dot com. So enough socializing. Feast your eyes on some candy captured by an iPad running the new View Client for iPad. 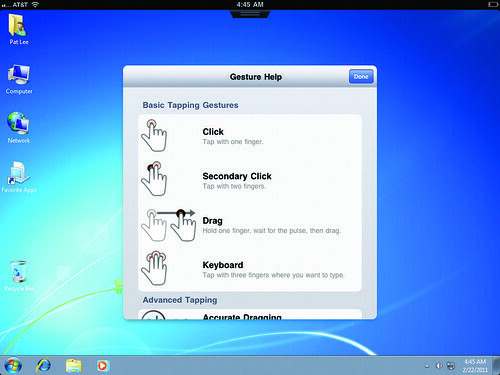 Wyse PocketCloud and iPad users in general will find the finger gestures familiar. Comparing the two apps, there are both similarities and minor differences in how the gestures map to functions. Apple has strict protocols for its App Store. Nobody outside of the development company gets pre-release copies or BETA software. Nobody outside of VMware has had their hands on this app yet, including myself, so I write this piece from information gathered from those at VMware who have developed and worked with the product quite extensively already. As I stated before, I’m overwhelmed with confidence in Tedd and his passion for client technology and from what I’ve seen, this client looks very promising. I’m looking forward to grabbing this app ASAP and I wish Tedd and VMware a very successful launch. I also look forward to the future releases and features Tedd promises. After all, upgrading apps on the iPad isn’t nearly the bummer that Windows or other platform application upgrades are what with the reboots, compatibility issues, etc. I’ll end with another quote from an old friend of mine who used to commonly say “What do you want for free?” In this case, it would seem VMware has done a pretty good job with the GA version of vVC. At this time I couldn’t ask for much more but ask me in a few weeks once I’ve had some seat time with it. Not yet released on the Swiss Apple Store … is this being released in the US only? For those of us new to or not fully familiar with all of VMware’s products, can a Mac Desktop be used not just a Windows desktop? Does VMware View integrate in any way with VMWare Fusion (such as Mac OS X Server running as a virtual machine in Fusion)? I’d love to be able to see and control my Mac Pro tower’s desktop with VMware View on my iPad (not to mention Windows 7 running as a Fusion virtual machine)! There is a VMware View client for the Mac, however, my understanding as a non-Mac owner is that the Mac client doesn’t support PCoIP. If true, that’s kind of crummy. I didn’t realize iPads were available for two + years. Boy time sure does fly when we’re having fun with tech! jason you are correct Mac client does not support PCOIP, even after the uprgade to 4.6. 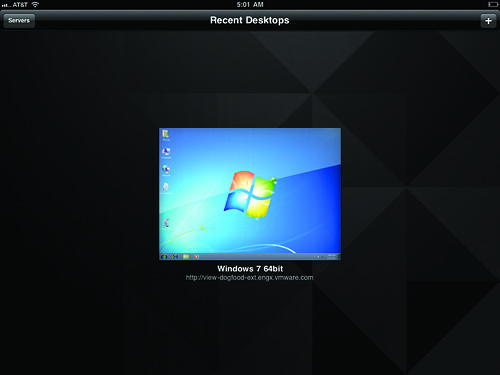 @eddie you can’t run macosx as a vmware view desktop , only windows xp and windows 7. Does anyone know if there’s a demo broker available to the public? Our SVP wants to try the new shiny out on his favorite toy and it might drive some View sales but I don’t want to be bother by a salesman asking me every week when we are going to implement. I’m sure I could provide you with a temporary broker and no frills Windows 7 desktop experience. 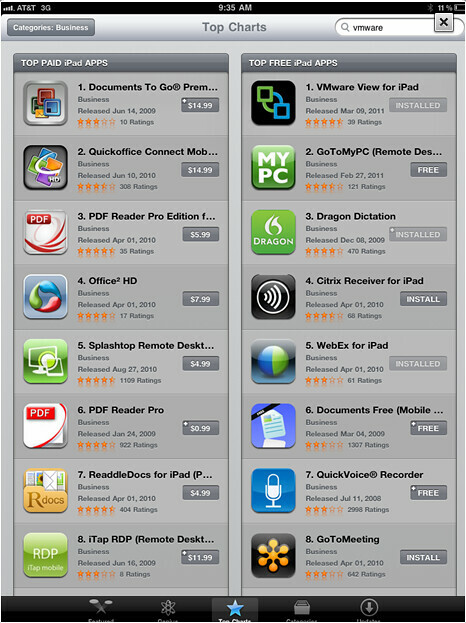 @jason Actually , to give all fairness, Citeix iPad app was #1 for many weeks. One annoying feature I noticed is that while I’m typing my password to connect to my virtual desktop , the characters are shown. my co-workers standing next to me was reading my password out loud. Had a meeting at a customer on Friday and mentioned this, security officer immediately put a ban on using the software. on an phone it’s not that strange to preview the character you type for the keyboard is small and errors are easily made, the keyboard on the iPad is large enough so typos will occur as much as on a normal keyboard. Hope somehow this will be fixed… for in Enterprise environments security is an important issue..
My experience is the password characters are briefly shown and then covered up. Another option for remote access to Windows apps from iPads is Ericom AccessToGo, a free RDP client for iPad, iPhone and Android devices. If you also want to speed up RDP, you can use AccessToGo with Ericom’s Blaze server (a commercial, not free product). That makes AccessToGo the fastest RDP client for mobile devices for working with graphic applications over a remote connection. If true, that’s kind of crummy.